Apple has released the latest update for their popular mobile operating system, iOS, which includes reliability improvements to HDR photography when using this option from the lock screen as well as multiple bug fixes for their iPhone, iPad and iPod touch devices. Among the bug fixes addressed is one that prevented the third-generation iPad from successfully switching between 2G and 3G networks. Apple also fixed a bug that affected AirPlay video playback under certain circumstances and improved reliability for syncing Safari bookmarks and Reading List, according to the release notes. Safari has been patched to stop several URL spoofing issues, which Apple says "could be used in a malicious web site to direct the user to a spoofed site that visually appeared to be a legitimate domain," in its security content knowledge base article covering the update. Fixes have also been provided for an issue that caused "unable to purchase" alerts to be displayed after successful purchases. 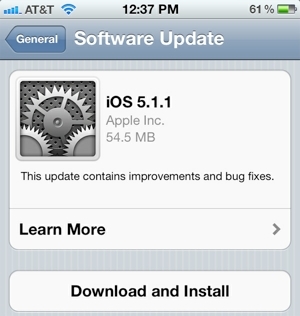 The 54.5MB iOS 5.1.1 update went live on Monday and can be installed through iTunes or over-the-air on devices already running iOS 5. To do this navigate to Settings>General>Software Update and tap the install button. You’ll need a Wi-Fi connection and your device hooked up to a power source if battery is below 50%.